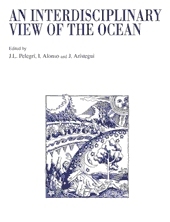 This book compiles a set of articles that arised following the communications presented in a meeting entitled "Taller y Tertulia de Oceanografía", held at Las Palmas de Gran Canaria, November 1998. The meeting was organized by the Biological, Chemical, Geological and Physical Oceanography research groups at the Facultad de Ciencias del Mar of the Universidad de Las Palmas de Gran Canaria. The meeting was financed by the Consejería de Educación, Cultura y Deportes of the Canary Islands local government and the Spanish Ministerio de Educación y Cultura. The publication of this special issue has been possible thanks to financial support by Consejería de Educación, Cultura y Deportes, Viceconsejería de Medio Ambiente, and Viceconsejería de Pesca, all from the Canary Islands local government, a grant by the Spanish Ministerio de Ciencia y Tecnología, a donation from La Caja de Canarias, and the financial and logistic collaboration of the Universidad de Las Palmas de Gran Canaria.